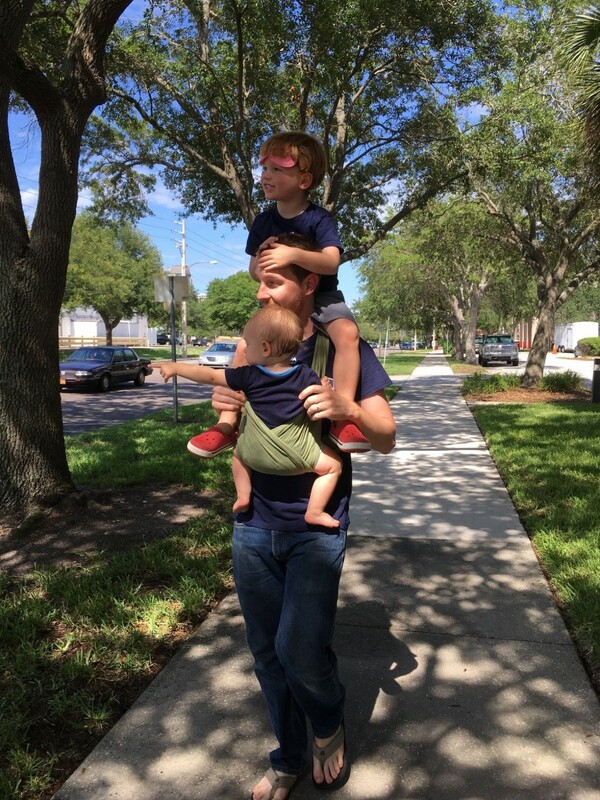 So it has been nearly three months since Father’s Day, and I honestly cannot remember what we did to celebrate Keith’s awesomeness. 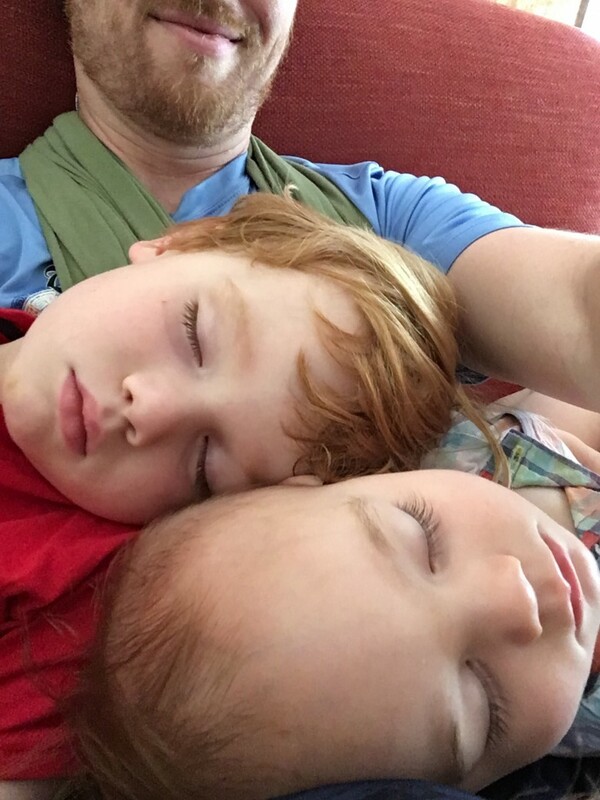 I took obligatorily adorable photos of Keith with the boys after church (I got one when all three were looking), and Keith got mega-Meyer-nap snuggles at naptime. Other than that, I’m sure we spent the day giving him our love, but the specifics just aren’t ringing a bell. Oops. 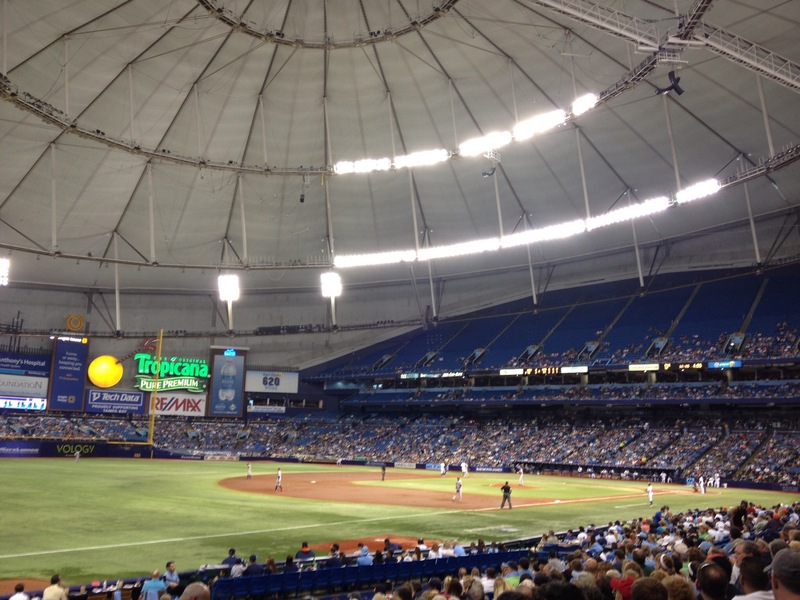 Later that week, we made our way to the Trop to see the Rays take on the Orioles. 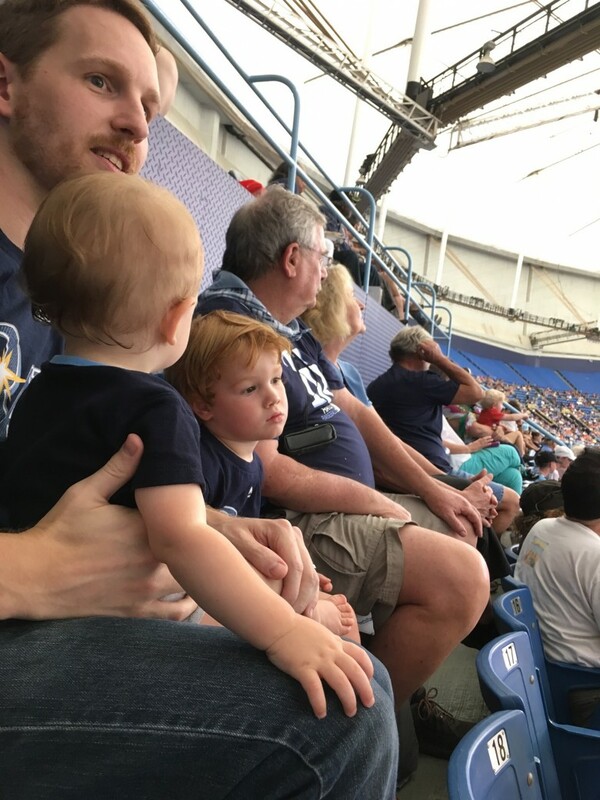 Elliot loved his first game, but I wouldn’t really know because I spent the majority of my time hanging with Henry around the stadium. Our main goal was visiting the touch tank so Henry could touch a stingray. That grosses me out, but he likes it and was willing to wait in line so we waited it out. 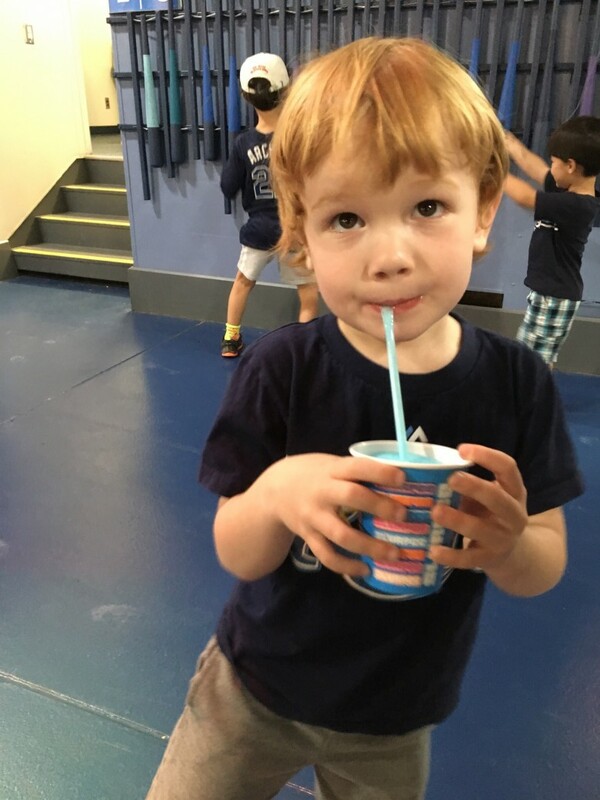 He drank his free blue slurpee in line (before he dropped it and made a giant mess and freaked out over not getting to finish it), and we were in the last group to touch the stingrays. Except the stingrays were totally over people trying to touch them, so it didn’t work out. Luckily, the view of the game looks fantastic from the tank area so we watched the game for a bit. 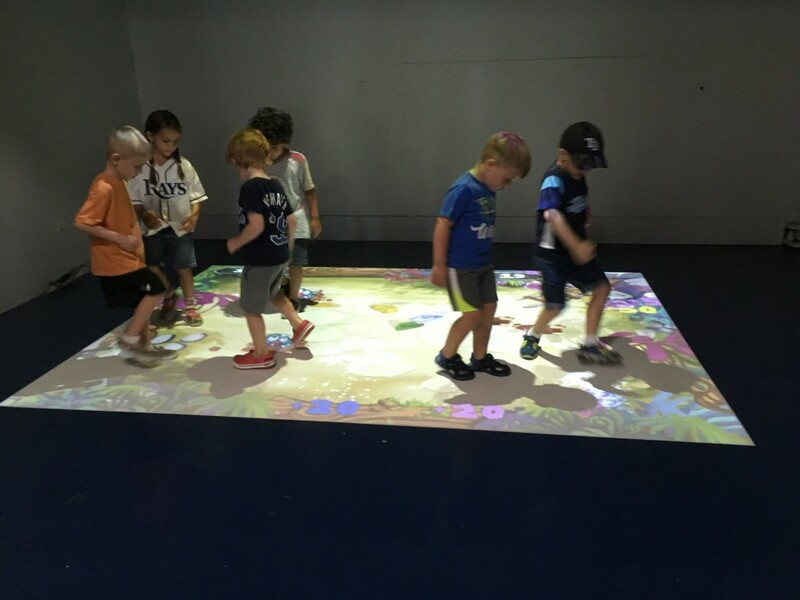 Next up, we rushed down to a kid dance party/game that Henry LOVED. It combined his two favorite things, so I just let him dance and play for as long as he wished. I sat in a corner and zoned out; it was bliss. 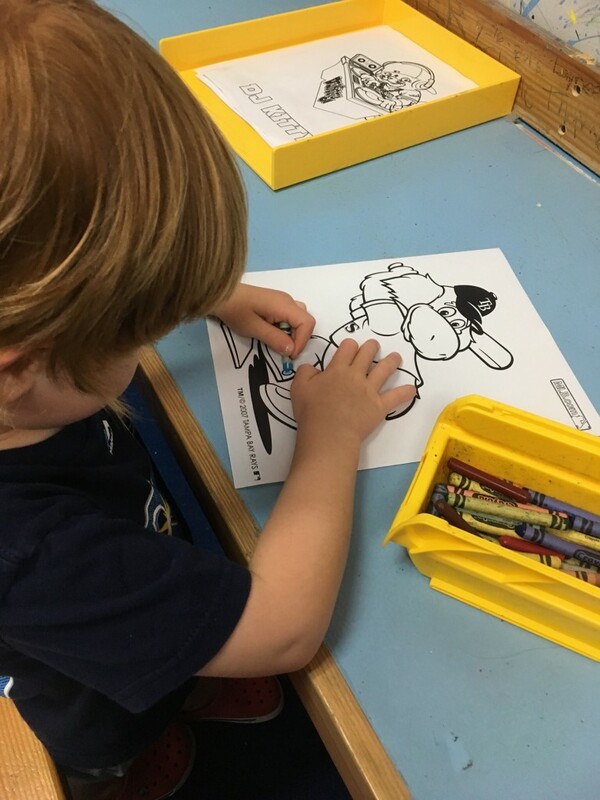 We tried to head back to our seats, but Henry found the coloring area so of course we had to spend some time there. He meticulously colored a DJ Kitty page and started a Raymond one before realizing he hadn’t made it to the kids block area and the game was winding down. We packed up Raymond to finish him at home and set off to play. Henry had so much fun; we never made it back to our seats. We eventually caught up with Keith, Elliot, Tom, and Margo after a game of tag (we couldn’t figure out where they were in relation to where we were). 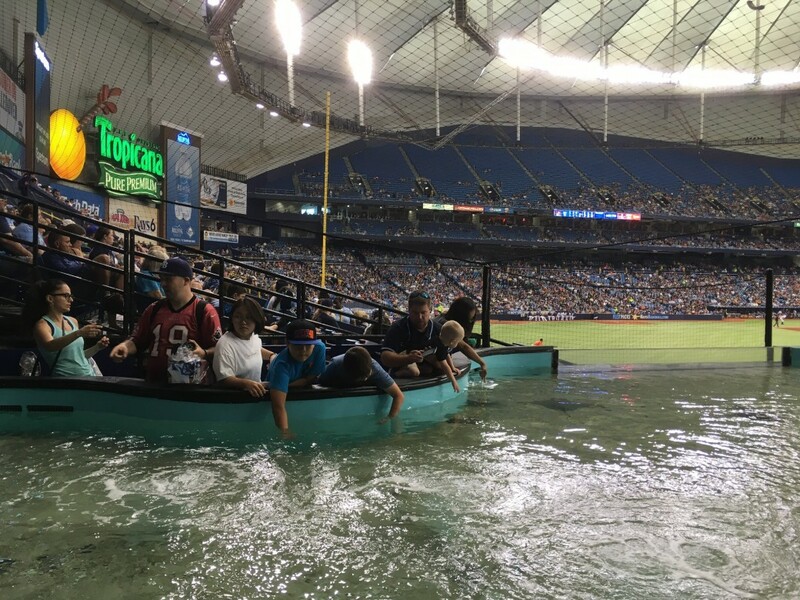 The Rays lost, but the gang had fun. 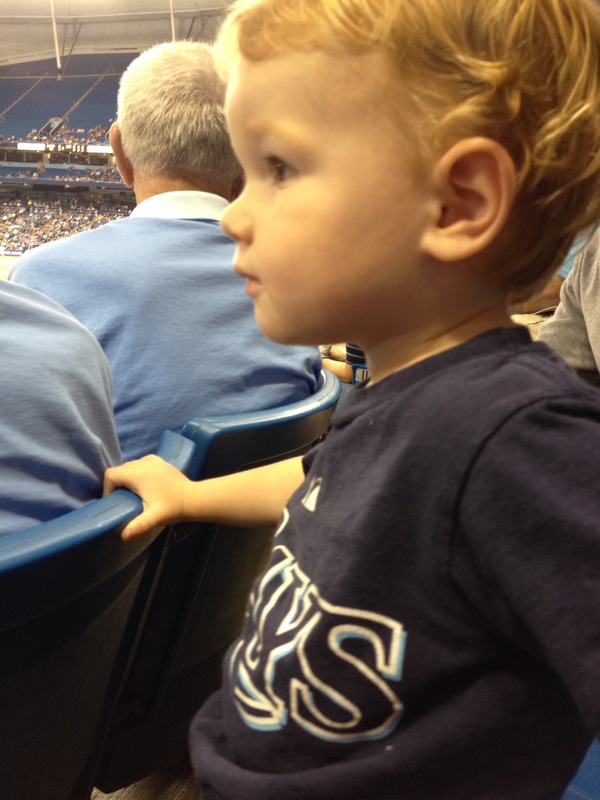 It seems fitting that on the day Keith leaves to attend the ELCA’s National Youth Gathering in Detroit, Michigan (Rise Up: Together – http://www.elca.org/YouthGathering) that I write about Henry’s first MLB experience rooting for our hometown team, the Tampa Bay Rays (Rays Up!). 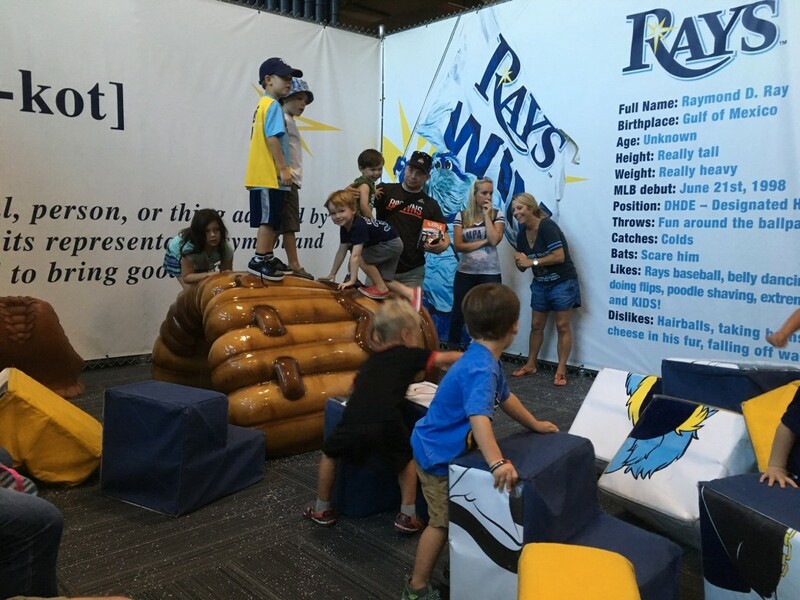 This past Saturday, Thrivent sponsored its annual Lutheran Day at the Rays, where Lutherans from this part of Florida could all attend a game together and support the Eckerd organization. 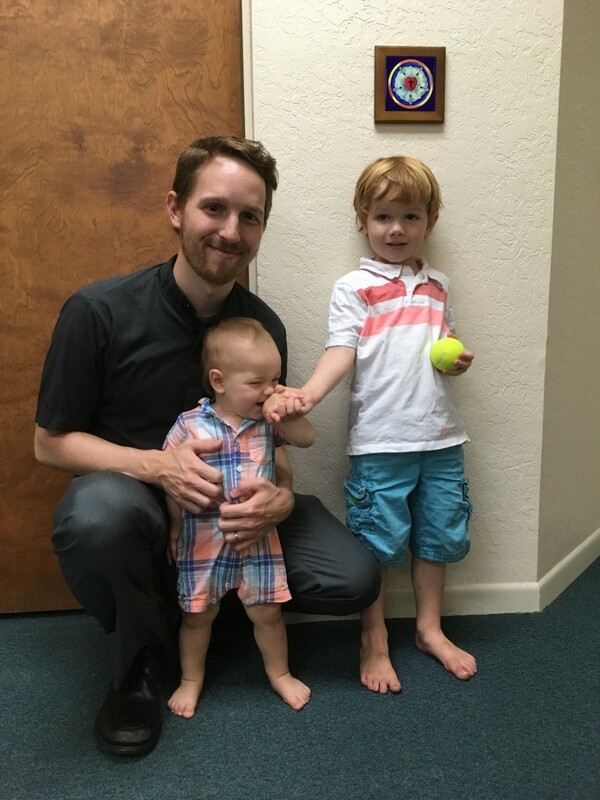 Our church, the Lutheran Church of the Good Shepherd, had twelve of us sign up to go, and the game did not disappoint! We arrived a little late to see the Rays take on the Astros, but once we found our seats the Rays came alive and scored. 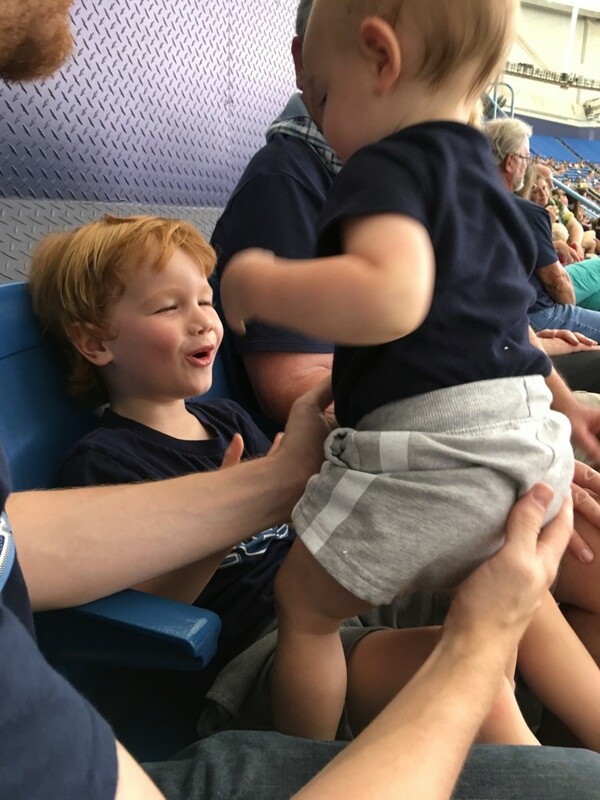 Henry calmly sat in our laps for the first part, probably overwhelmed with everything happening in the stadium – from the lights shining, the music blaring, the crowd roaring, and the TV screens flashing – a lot was happening for our little guy to take in. 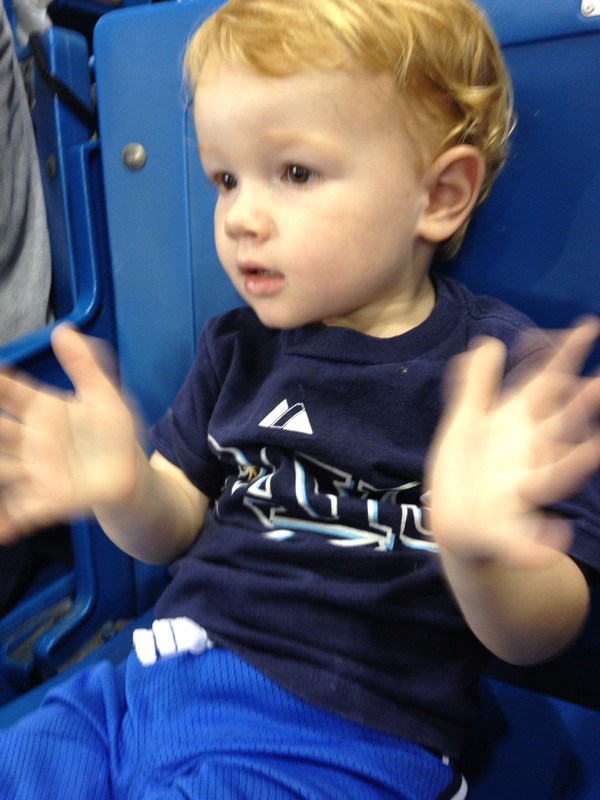 He really liked the music and cheering, and soon began to dance and clap for the home team. Another awesome thing happening was the crazy thunderstorm raging outside the ballpark – we could see the wind and rain hitting and moving the roof and shaking the lights at the top of the stadium. It was scary, but also very cool. During the middle part of the game, Henry and I walked around the whole stadium. I tried to acquire a first time attendee buttons for him, but they were gone by mid-game; next time I’ll get him one for sure. We also tried to see the sting rays in the touch tank, but Henry decided he didn’t want to wait in a long line. So we played musical bats, colored mascot pictures, and climbed all over a giant baseball glove. When we returned to our seats, the Hen was ready to watch baseball and eat popcorn (mostly eat popcorn). 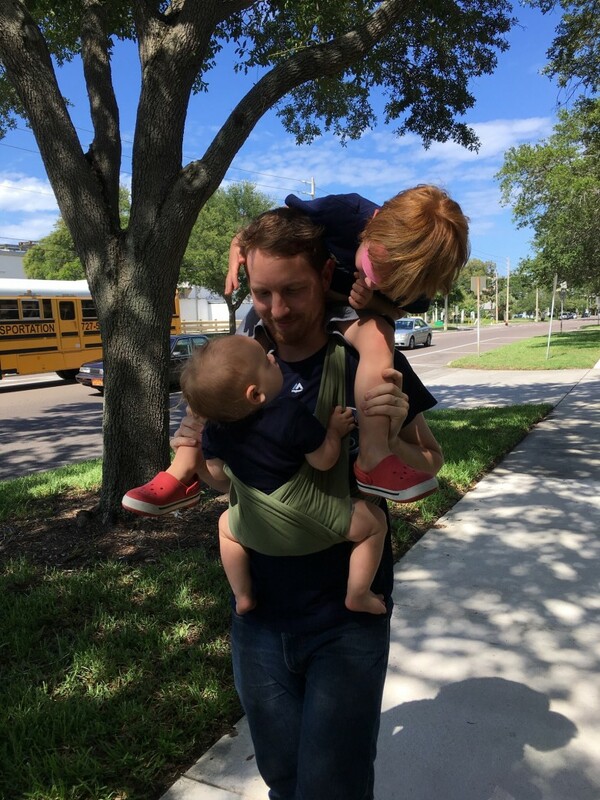 He got antsy again so Keith took a turn walking around with him, but they made it back in time to see the Rays win! 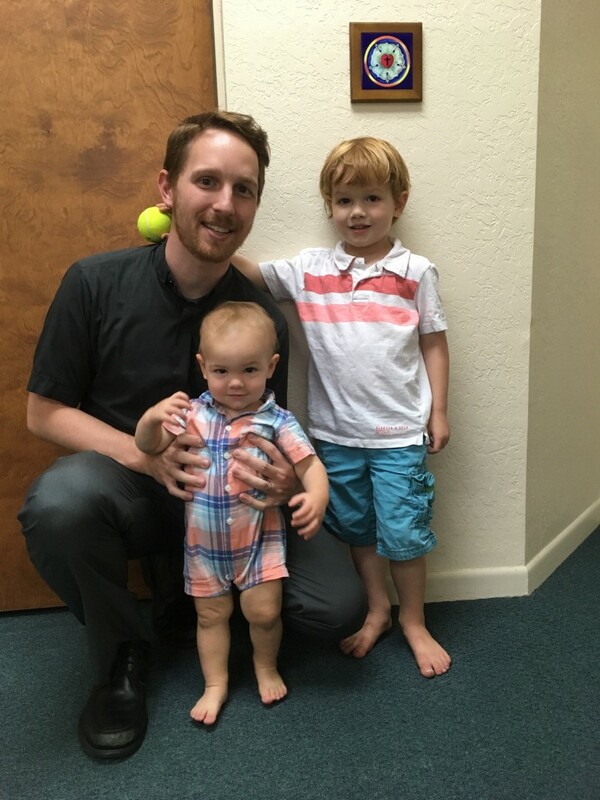 Henry and us Lutherans must be good luck charms for the Rays, who were having a losing streak before the sweeping Astros weekend. 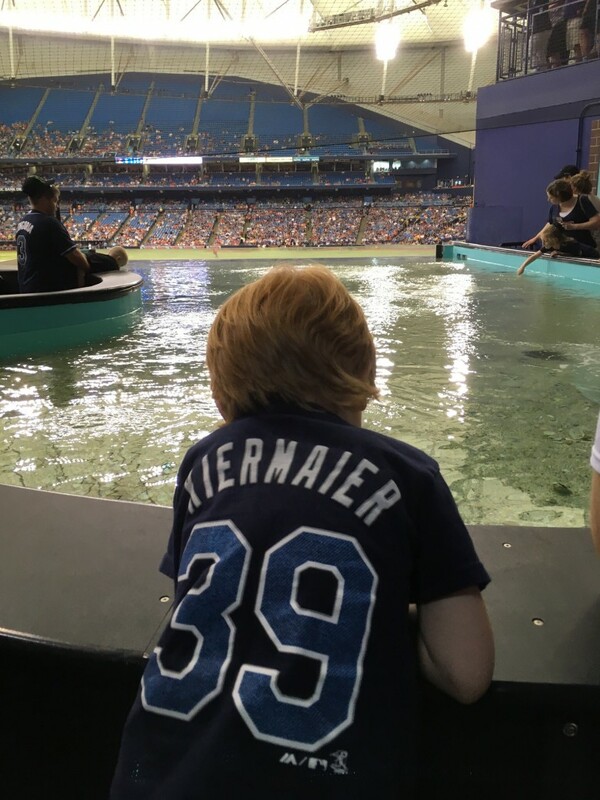 Rays Up, indeed!